The new Tier 1 one-to-many at GEDmatch includes a link to your match’s family tree when that is available. Clicking the word GED next to that kit’s email address takes you to the tree your match has uploaded to GEDmatch. 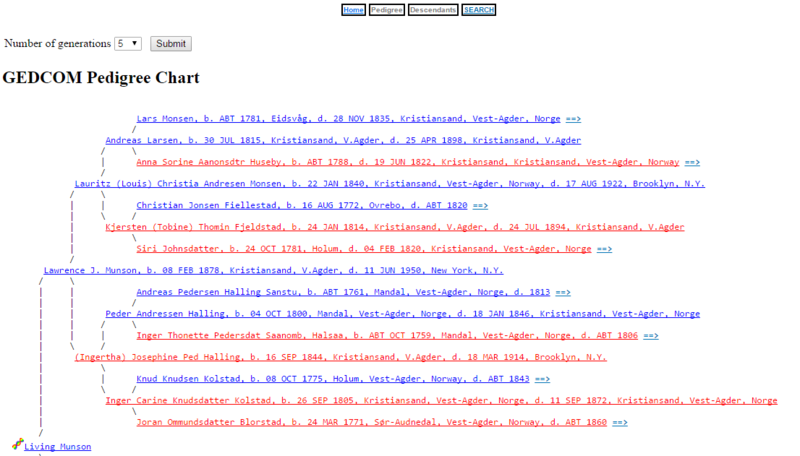 The word WIKI links to the compact tree view at WikiTree. 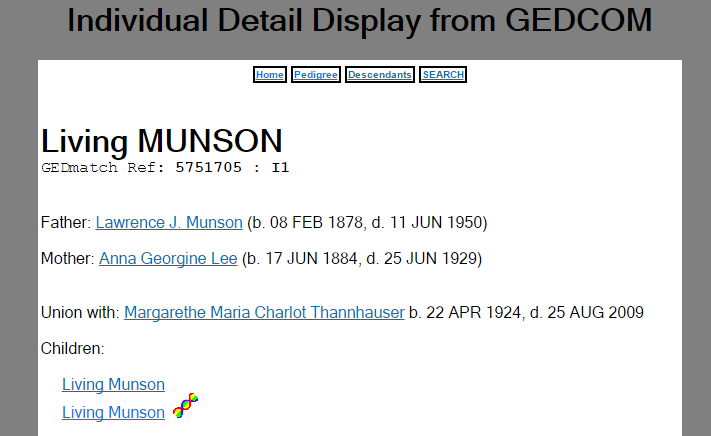 Clicking on the GED for a match takes you to the profile of the individual in the linked tree at GEDmatch. Here is what you would see if you clicked on the GED next to my Dad’s name. Note the words “GEDmatch Ref: “ followed by a long number. That number is the id of this GEDCOM which you can use to compare to your own GEDCOM in the “2 GEDCOMs “ function on your home page. Of course, I immediately click on the pedigree button in the little menu at the top of this individual page and then look through the pedigree on the next page for familiar names and places. Here is what the top half of my Dad’s tree looks like at GEDmatch. Note the default number of generations shown is 5. You can change that to a larger number (I often go to 8) and then click submit to see more generations. Clicking on WIKI next to a match in the Tier 1 One-to-Many listing takes you to that match’s compact pedigree at the collaborative world tree WikiTree. 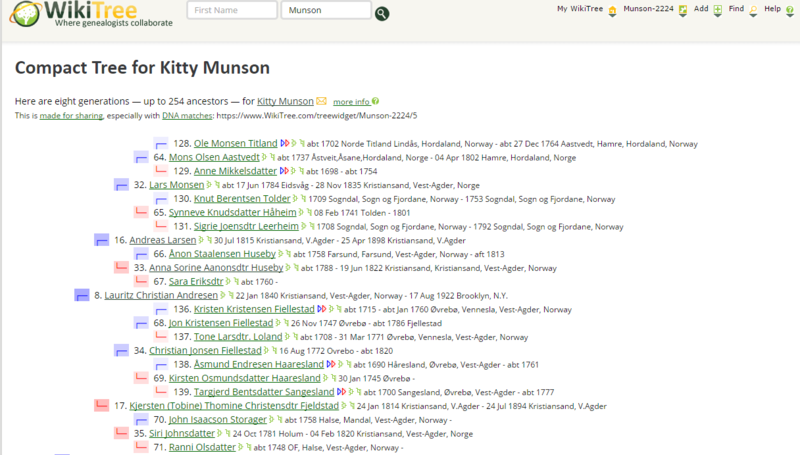 This is automated and the connection to Wikitree happens because a member of that site has added a GEDmatch kit number to a profile there. Here is the top piece of what you see when you click on my WIKI. Notice that each person is numbered according to the ahnentafel scheme. Also the colors pink and blue before the names indicate whether they are male or female. As a slight digression, there is a function at WikiTree to show you which ancestor can give you X. Sadly some of the folk who have put their GEDmatch kit numbers in at WikiTree have not yet set the privacy level on those profiles to have a public tree so you see a page telling you the privacy is such that you cannot see the information. Send them a note asking them to change the privacy level for that profile to have a public tree. This maintains the privacy of the living while showing the compact pedigree. Click here for the slide from my recent presentation demonstrating this issue (click the forward arrow a few times to fill the slide in). Wikitree is an easy to use online tree with no login required to see a tree. You do need to create an account to add your family there but you may find that, from your great grandparents on, your ancestors are already listed. It does allow you to upload a GEDCOM. You can read more about it in my post about the various one world trees. I love your detailed site. I am having a real hard time grasping the concept of downloading tier 1 to a spreadsheet. I have read everything I can get my hands on, and it’s just not sinking in, so I thought maybe watching a tutorial video, is there one available? I don’t usually download the Tier 1 one-to-many to a spreadsheet although perhaps it would be useful to keep track of which matches I have looked at. I prefer to keep two spreadsheets. One is a list of people I have contacted and the other is a list of matching segments. 1) first you select the whole page and then you paste it into your spreadsheet program. To do that press the “ctrl” and the “a” at the same time (referred to as control-a in most documents) or use the “select all” on your browser’s edit menu. 2) next open a blank page in your spreadsheet program and press control-v (or use the paste function on the edit menu there). Then wait for a bit. 3) Once the data appears in your spreadsheet, adjust the column widths by dragging them at the top. That last link includes several video tutorials about using spreadsheets. Sorry if this is off-topic but I’d like to know if GEDmatch has a support page or any kind of help. For instance, I would need some sort of explanation for statements on GEDmatch like “Selecting less than 7 cM may result in much slower response.” What is cM? How do I know what number to pick and why? There should be some sort of information available to explain things. The top left box at GEDmatch called “Learn More” has links to all kinds of help. GEDmatch now links to ancestry in WikiTree for free using their “One-to-many” match utility. You no longer have to be a paying Tier 1 member.